After assemblying my Ultimaker I tried to use the control panel to move the print head around. The y-axis and z-axis work great but the x-axis only works intermittently. Sometimes it will only run half of the requested distance, sometimes the print head wont move at all. I tried disconnecting the limit switches to see if it was one of them that was the issue, but still get the intermittent problems. I also tried using different drivers and both a windows and mac to see if it was a software issue. Then I switched the x and y axis cables to see if it was the motor or the controller causing issues. After switching the cables the x-axis motor worked fine and the y-axis motor started having intermittent issues. It would appear that the hardware or firmware is at fault. I was hoping someone might have some insight on further troubleshooting efforts. Also all the stepper motors are warm except for the x-axis motor. Not sure if that is normal. There was something on the ultimaker wiki about stepper motors not getting enough power, but I cant find it anymore. What they said was the following: The stepper motors have a current control on it. It should be pointing towards the middle. Its usually done in the factory, but I think this one slipped through. Its easy to check actually. On the bottom of the ultimaker, on the board there should be 4 polulu stepper drivers. They are the 4 big blocks that stick out of the ultimaker motherboard. Seen here on the upper right. There is a resistor there (the black square with a white round thing in it where you can stick a screwdriver in) that can be turned. They all should be positioned in the middle of what they maximum can turn (be careful though, too much left and it wont power the stepper motors, too much right and you will overheat the stepper motor). My guess is that one of them (the X-axis one) is turned too much to the left. Turn the power down completely before turning, or it will fry the driver. I reset all the resistors by turning the screws all the way left, then all the way right and finally returning to the middle point between the two extremes. The problem still occurred with the x-axis. I then increased the power by turning the x-axis screw slightly right of center, but the x-axis still failed to move every time. I'm going to re-check everything tomorrow and un-mount the board so I can have a look at the connector in detail. Perhaps there is a loose joint. Any other suggestions in the mean time? Perhaps there is a loose joint. Any other suggestions in the mean time? Try swapping the X polulu stepper driver board (pulls out) with Y one to determine if it is that. If it is, check it for dry joints etc. Swapped them and the problem still occurs on the x-axis. I had previously swapped the motors so it appears to be upstream of the polulu driver or between the polulu driver and the motor connector. I unmounted the board and didn't see any abnormal solider joints or traces. Looking forward, if i just buy a new Arduino and install it on the board, and then use ReplicatorG to install the Ultimaker firmware, is that all I have to do to swap Arduinos? I'm no expert on the Arduinos but I think that's right. I also think that's right but would be VERY surprised if that fixed the problem..
Its either that or something's wrong with the motherboard (and then you really need to send it back to trace the source). Have you contacted ultimaker? If its not the arduino, then its certainly something wrong on the motherboard (faulty hardware). You said that all the connections were ok. That means that its either going wrong with the step size or with the arduino. Cant pinpoint it to something else. Initializing Serial. Attempting to reset RepRap/Ultimaker (pulsing RTS) Unknown: marlin u0.9.3.1 Unknown: sd init fail Ready. Initializing Serial. Attempting to reset RepRap/Ultimaker (pulsing RTS) Ready. The problem is similar with each firmware except that I get a few more moves out of the 5D firmware before the motor stops responding. I now note that when I first power up and connect the machine I can issue one to three commands via the x-axis driver and the machine responds. After these initial commands, the motor stops responding. If I then power off the board with the switch, but not unplug the USB cable and power the board back on, the motor will again respond to one to three commands. The whole time the Arduino is connected via the USB cable and ReplicatorG stays connected. I have another Arduino Mega on the way, I figure you can never have too many of those. If that doesn't fix the problem, then it would seem that it is in the Ultimaker board somewhere. This would be supported by the fact that power cycling that board allows me to issue a few commands again. I'll try to contact them about what it would take to get a replacement board. In the meantime, I want to thank everyone for the helpful advice and if anyone has any other ideas I'm all ears. A little frustrating to be so close and yet so far away. Have you tried printing or tried host software that's not repg? The repg control panel is a bit flakey at the best of times.. I was thinking the same thing. Either a faulty arduino, loose joint or problematic capacitor. Cant think of anything else when looking at the schematics. 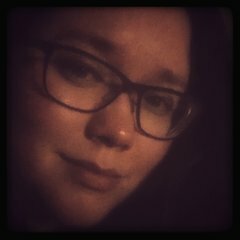 The problem pinpoints to the direction the people suggest in this thread. Probably there is a loose solder connection on the main print. 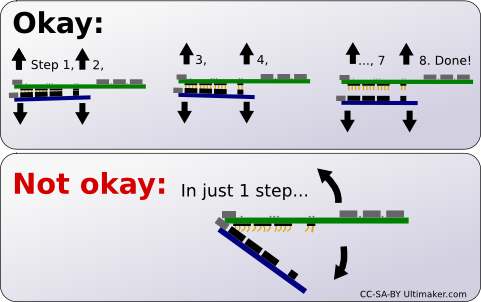 Due to the heating up of the stepper, the connection might get loose contact because of a bad solder connection. There are 3 signals going to the board, direction, step and enable. It might be that the step signal or the enable signal is not getting to the board. If the step signal is not getting to the board, it should still get hot. 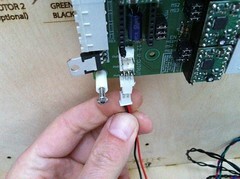 But if the enable signal is not getting to the board, it will remove power from the motor. Therefore I think this signal is not getting correctly to the stepperdriver. Please check the soldering connection of this signal. The signal is called EN(able) on the bottom of the stepperboard, top left corner if you look at the bottom. Follow the trace that is connected to it on the mainboard and check if the soldering is ok, both on the side of the stepper and the side of the arduino. Sometimes the soldering looks ok, but actually it isn't. To be sure it would be best to solder them again and test.